It’s Valentine’s day, and one of the largest and most enduring valentines ever received in the United States happened this week, some 63 year ago, in 1949. And you may not know it, but a piece of that once famous valentine resides in Northwest Ohio. It was called the “Gratitude Train”, or the Merci Train. 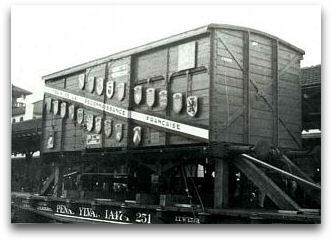 A 49 box car train of thank you’s extended to the citizens of the United States from the citizens of France. Each of the cars filled with hundreds of gifts, artifacts and treasures, large and small, from the French people, as a heartfelt expression of gratitude for the American’s outpouring of love in the form of the famous “Friendship Train” of 1947. This was the train that Americans sent to help French families get back on their feet after enduring the ravages of World War Two. The Friendship Train, first proposed by columnist Drew Pearson inspired some 20 million Americans to donate enough items of food, clothing, medicine, money, toys and books to fill 700 boxcars that traveled the nation’s breadth on its way to New York where it was shipped to France. Overwhelmed by the generosity of the Americans, the French citizens in February of 1949 reciprocated, sending their own Merci Train to the Americans. 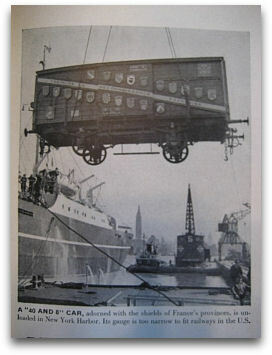 It arrived in New York Harbor by ship on February 2nd, 1949 and each state was designated to receive one of the boxcars. The gifts in the 49th car were to be divided between Washington D.C. and the territory of Hawaii. The Merci Train Arrives in the U.S. In Ohio, the small four wheeled World War I era boxcar, known as a Voiture, or a 40 and 8 car because it could either carry 40 men or eight horses , arrived in Cleveland on the 10th of February. Thousands of residents of that city, along with a host of public officials flocked to visit the special wooden boxcar and to view the gifts packed inside. From Cleveland, the car would make several stops in other cities around the state, including Toledo, where Mayor Michael V. Disalle (who would later become Governor), and a welcoming committee turned out on a cold February day at Union Station to feel the warmth of the grateful French nation. 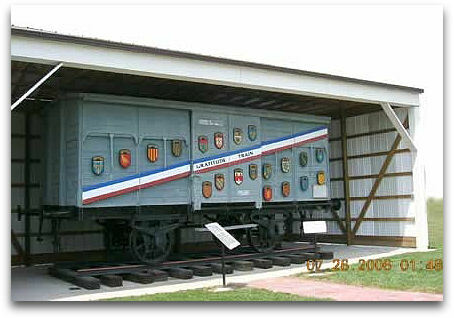 Inside the Ohio boxcar was a collection of items that included art, wine, cheeses, toys, books, clothing, needlework , French family heirlooms, war medals, and letters from individuals who personally offered their thanks for all the Americans had done. So whatever happened to that boxcar? Well, it’s right here in Northwest Ohio, proudly displayed at Camp Perry near Port Clinton. In fact, it has been at the Camp since 1950, where it was taken after the Ohio tour in 1949. The gray wooden boxcar was parked on the grounds of the military post in Ottawa County and then largely forgotten over the years. But in 1986, a group of local volunteers and historians, brought the car and its meaning back to life with a restoration effort. In November of that year, the freshly renewed piece of history was dedicated and opened to visitors at Camp Perry. And over the past 25 years it has been restored two more times. In 1998, after suffering tornado damage and again in 2006, when it got a new coat of paint and a display of plaques from the various French Provinces where the train had first traveled in France. The “voiture” is currently parked under a partial canopy, amid a larger display of other military artifacts of tanks, guns, and aircraft and is available to visitors to behold, however, only the exterior of the boxcar. The interior of the car is empty. Removed of its precious payload some 60 years ago, the whereabouts of those items are mostly lost. The Ohio State Historical Society has about a half- dozen of the items, and even they are no longer on display, but in “storage” in Columbus. The photos of the items, however, can be viewed on their website. 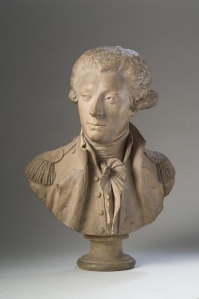 They include a bust of General Lafayette, a wedding dress, a copper kettle and an antique French doll. So while the proud old “voiture” boxcar that rests at Camp Perry may now be empty, its significance is not. For those who can appreciate what this meant to the American and French alike, it is filled with memories of how the citizens themselves of two nations can indeed forge common bonds of friendship and can reach across the ocean to make a real difference. Drew Pearson, the newspaper columnist, would observe later that the exchanges between the two countries had prompted millions of American and French children to begin pen pal relationships, predicting that many of these young Trans-Atlantic friendships might endure for decades in the future. I wonder if they have? But also wonder why this Valentine’s Day story is so seldom told or taught in history books of World War Two. The story of not how war is waged, but how peace is waged. Other links on this story you may enjoy. TOLEDO — There is no larger musical instrument or nothing more majestic than a concert or theatre pipe organ. In Toledo, we still have plenty of people who love to listen to their powerful music and luckily a number of people who are passionate about keeping their music alive. That passion for the big organ sound is in evidence this with the Toledo Symphony Orchestra as they continue to present special organ concerts featuring the now restored and historic Skinner organ at the Peristyle. For those who have never heard the Skinner organ or any large theatre or concert pipe organ, it can be a thrilling experience. (Think Phantom of the Opera). So what is it about this big music that we love so much. “It’s a combination of all the parts coming together to make a wonderful sound.” says Evan Chase, who is President of the Toledo Theatre Organ Society. Chase, who doesn’t play the organ is fascinated by them and has become an expert technician who can tune and restore them. He currently has two of the large theatre organs in his south Toledo home. One of them is a “Mighty Wurlizter” organ, made in 1926, salvaged from the Loews’s Theatre in New Rochelle, New York. This organ with a beautiful wooden console, he is hoping to donate it to someone or some group that wants to give it a good home in a local theatre or concert hall. While the Wurlitzer that takes up much of his living does not currently play, Chase has another, set up in his basement, and it does play and is the centerpiece of his own old-time movie theatre, complete with seats, a large screen, and projector system. The Golden Kimball organ, he says, was originally installed nearly a 100 years ago in the Capital Theater of Aberdeen South Dakota. It was purchased by a Minnesota businessman in the early 1970’s and eventually found its way to Toledo and to Chase’s basement. The Kimball, which uses player piano rolls to key the music, belts out a huge sound from it many ranks of pipes and other mechanics which are hidden behind the interior walls of the basement theater. Chase, 63, and now retired, says he became interested in this pipe organs many years ago when he visited a theater organ concert in suburban Detroit. ” “When I heard and saw that golden console rise up from the orchestra pit and hearing that and seeing the old movies again, I said this is it, this is my life’s work.” And the work of keeping these antique instruments in good shape is considerable. There are thousands of parts and there can be many ranks of pipes, all tuned precisely to a specific pitch, and each organ employs a system of air and mechanics to make the sounds. Without constant care and stewardship, they can become unplayable. Even the tuning can be thrown off with a change in the humidity or temperature. At the Peristyle, the restoration of the grand Skinner organ a few years ago was a major undertaking and required hundreds of thousands of dollars and meticulous detail in the rehab. Evan Chase, meanwhile, hopes he can find someone in Toledo who would be willing to take the big Wurlitzer, invest in its future well-being, and use it in a fitting venue. So far, he hasn’t found any takers. Historically, the large pipe organs were the primary source of music for Toledo’s many movie palaces. They were used in silent movie houses to play a musical score along with the action on the screen. But they fell silent and out of favor when the “talkies” or motion picture sound came into being, or when theatres could use recorded music. Facing obsolescence, many of these musical giants were left in the dusty backrooms or just found their way to junkyards or demolition yards. But not all. Many of them were fortunately rescued. Their value was appreciated by historians and they were frequently restored and reused in other venues. In Toledo, the “Mighty Wurlitzer” that once the throaty “voice” of the famed Paramount Theatre downtown was also headed for an uncertain future when the old theatre building was torn down in the name of “progress”. Effiorts to save the organ locally were futile. Thanks to the efforts of those recognized its potential, the Golden Wurlitzer found its way to California in 1986, where it was restored is now the featured organ at the Berkeley Community Theatre near San Francisco. At the Ohio Theatre on Lagrange Street, which is currently under renovation, the pipe organ still remains on premises, and Evan Chase and others involved in the renovation of the theatre, hope it can be restored to its former sound and power. Chase is also looking at other various old movie theatres around the Toledo area to see if he might be able to place his Mighty Wurlitzer there and re-create a classic movie palace, but the choices are limited. In downtown Toledo, the only large movie palace left is the now restored Valentine Theatre, but they have reportedly declined the offer to take the Wurlitzer and use it there. At one time, in downtown Toledo, there were over 20 big movie and live performance theatres, but those days have faded, and most fell to the fate of a wrecking ball. Chase, who is also a classic movie buff and promoter is currently offering special classic film series nights at the renovated Maumee Indoor Theatre on Conant Street. In a future writing, we’ll talk more about his efforts and the desire of others (including this authors), to recall with great fondness, those days when downtown Toledo in the evenings was ablaze with marquee lights and a full spectrum of entertainment choices. It was known as “Toledo’s Trunk Mystery” and for a while in 1886, it was probably the most talked about story of the day. Not just in Toledo, but around the world as it made headlines in many major newspapers. And no doubt it would be just as attention grabbing today, for this story was not only sensational, but laid bare the grisly truth of grave robbing by medical schools. A story that began in a Toledo train station where the lifeless body of a young woman was found in a large trunk. As the New York Times relates the story on September 11, 1886, the trunk had been put on the Wheeling and Lake Erie train earlier in the day in Bellevue, about 40 miles east of Toledo. Police stayed with the trunk and waited for someone to claim it and and finally a man did. He was promptly arrested and identified as Martin.E. Wilson. He told police he lived near Bellevue, Ohio and didn’t know the contents of the trunk but had been given money by “certain parties” to take the trunk to Toledo where he was to turn it over to a Dr. Hill from the Toledo Medical College on Lagrange Street. Dr. Hill, however, later said he knew nothing about it. A subsequent investigation by the Lucas County Coroner’s Office concluded that the woman had died of consumption a day or two earlier and without any foul play, but for some reason this woman’s body had been spirited away before her burial. The coroner even noted there had been puncture marks under the arms for embalming. By the next day, however, more information was forthcoming and it was revealed that the body was that of Belle Bowen, the 17-year old daughter of a well-known and “prosperous farmer” John.M. Bowen. She had died of consumption(tuberculosis) and had been buried in a small cemetery near Attica, but her grave, still fresh from the Friday burial, was exhumed that same evening. It latercame out at trial that Wilson had worked under the light of a full moon that September night to pull her body from the grave and then put it into a large trunk before loading it on the train to Toledo with a final destination at the Toledo Medical College. When news of what appeared to be a “grave robbing” surfaced, indignation grew rapidly. And it was widely speculated that this might have been part of a regular system of grave robbing that had been taking place to help medical schools obtain cadavers for research and training. The Bowen family doctor, an H.G. Blaine was arrested. It was alleged that the man who took the trunk to Toledo, Martin Wilson was his assistant and the two of them had conspired to steal the body of young Belle. Wilson also faced charges, along with several staff members of the Toledo Medical College. Back in the Attica and Bellevue area, neighbors and townspeople were irate. A number of men threatened to lynch the two medical men if they returned to the area. Meanwhile, farmer John Bowen traveled to Toledo, with the empty coffin of his daguhter to reclaim his beloved Belle. In the ensuing trial, it was learned that the 35-year old Wilson was a medical student who had been offered free tuition by the Toledo Medical College to bring them cadavers which were rare in those days since there was no lawful way to obtain them. Wilson was eventually convicted and sent to prison, while Dr. Blaine was cleared of charges, claiming that he didn’t know Wilson had stolen the body and had merely helped him buy the large trunk. Blaine eventually returned to practice and moved to Willard Ohio. The staff members at the college were also cleared of wrong doing. Today, Belle Bowen’s body lies undisturbed, and otherwise undistinguished in her grave at the tiny Omar cemetery near Attica, alongside her parents and other family members. There is no notation of how famous she was in death in 1886 when much of the world knew her name and her macabre story. The practice of grave robbing was apparently in vogue for a number of years in the Toledo area, for only ten years later after this case made Toledo famous, another Toledo doctor was arrested for stealing corpses from the Toledo Infirmary cemetery. Dr. F.O. Hunt was charged with stealing the body of Edwin Cartwright from his grave. The New York Times reported that the coroner at the time, said he was believed to be “part of a gang of professional ghouls operating here for several months and reaping a rich harvest”.